This weed sends out leaves in a basal rosette from seeds that germinated last year. Like other members of the mustard family (Brassicaceae), its tender greens are edible. You might be fooled by the common name—the plant is typically not bitter, but rather peppery in taste. Its flowers can be tough to chew, but the tender leaves are said to be a source of vitamin C, calcium, magnesium, beta-carotene and antioxidants. 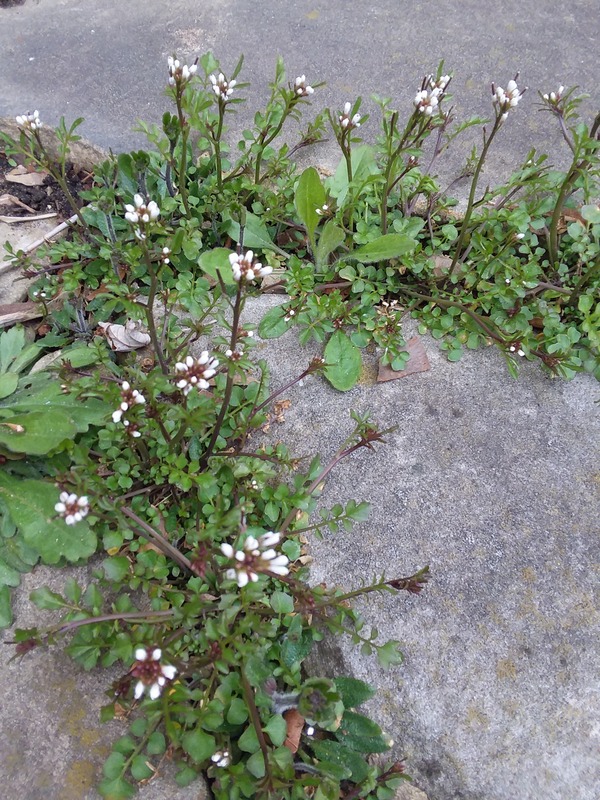 Speaking of flowers, hairy bittercress produces a small cluster of tiny flowers each with 4 white petals. Narrow seed pods stand tall above the flowers. When dried or disturbed, the seed pods "explode" sending seeds in all directions. This seed dispersal strategy is known as ballochory. Jewelweed and cranesbill also employ this as a strategy to spread seeds. Removing plants prior to them setting seed is highly recommended. In northwest Ohio you will have to move pretty quickly as it doesn't take much time for the seeds to develop. The use of a pre-emergent herbicide can help reduce future populations. Hairy bittercress can be a nuisance in the landscape, turf, greenhouse and nurseries.